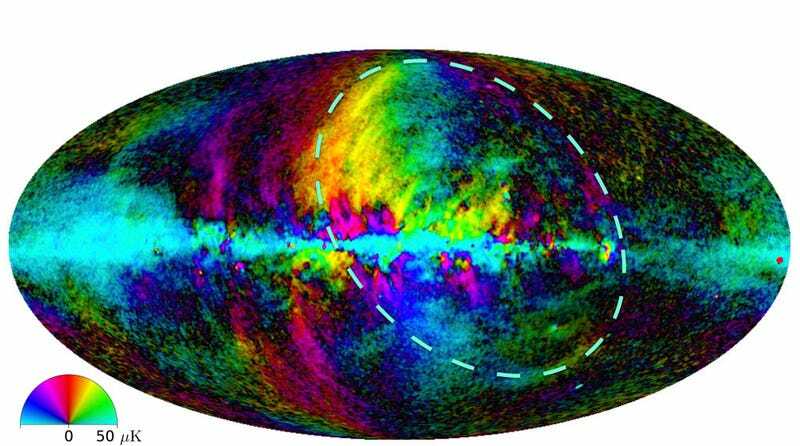 Scientists working with the Planck Satellite have produced a new polarization map of the Milky Way in microwaves, providing an unprecedented view of a rather dramatic electromagnetic loop discovered over a half-century ago. Above: Loop 1, marked by the dashed ellipse, is the yellow feature above centre, shading to purple, and the purple arc below centre. The colours represent the angle of the magnetic field and the brightness represents the signal strength. Image caption and credit: M. Peel / JCBA / Planck / ESA. This image was unveiled earlier today at the National Astronomy Meeting (NAM 2015) in Wales by astronomers Mike Peel and Paddy Leahy of the Jodrell Bank Centre for Astrophysics (JCBA). It’s a full sky map showing synchrotron loops and spurs in which charged particles spiral around magnetic fields; this form of electromagnetic radiation is emitted when charged particles travel in curved paths. One of these loops, dubbed Loop 1, accounts for a rather large portion of our wide field view. Astronomers aren’t sure how far away it is, with estimates ranging between 400 to 25,000 light-years away. It’s thus difficult to know just how large it really is. It has been theorized that supermassive black holes produce synchrotron radiation by ejecting jets of accelerating ions through the warped “tubular” polar areas of magnetic fields. Contact the author at george@io9.com and @dvorsky. Top image by M. Peel / JCBA / Planck / ESA.